Left side of face. Here I have a couple of white heads too. When i took these pictures it wasn't a good day. 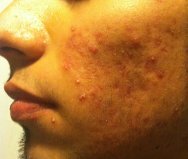 Derm had me on Minocycline and retin A .25% and was about a week into use.